What Is a Mutual Fund Prospectus? How to Read and Understand It. What is a mutual fund prospectus? It’s a document that gives you an inside look at your mutual fund, and it’s about as inviting to read as a telephone book. That’s exactly the way Wall Street likes it. As long as you don’t take the five minutes it usually requires to go through the document, you won’t be aware of the fees the fund charges you. Also, by failing to read the prospectus, you’ll be in the dark about the wild investments the 25-year-old multi-billion dollar fund manager can make with your money. There is no way around it. For certain investors, reading the prospectus is a critical step in mutual fund evaluation. Well, after you finish reading this post, the sharpies on Wall Street won’t be able to be so smug. Failure to read the prospectus (for some investors) is one top reason why people lose money, and it doesn’t have to be that way. Let’s go through the prospectus (and Statement of Additional Information) to see how easy it is to look under the hood of any mutual fund. This is a long post. I’m going to show you how to pick apart a prospectus in about five minutes and know everything you need to know about any fund or ETF. At the end of the post, I’ll discuss which kind of investors really should be taking the fund prospectus apart like this and which kind of investors don’t really need to. Let’s get to work. A prospectus sounds intimidating, but it’s not. It simply spells out the rules the managers of the mutual fund have to play by. It lets investors know how much the fund charges and what the fund can and cannot do with the money. It spells out the investment objectives and talks about the people running the fund. It also talks about any restrictions on trading and provides financial results. Pretty important stuff. What is a Statement of Additional Information? This is actually part of the prospectus. Though few people even know it exists, it is actually more important than the main prospectus. In essence it is just an additional part of the fund’s registration statement. (Mutual funds must register as an investment company with the SEC. The prospectus and the Statement of Additional Information (SAI) are two of the many documents they file when they register. The SAI is sometimes harder to get a hold of (I wonder why?) but the fund must send you one for free if you request it. Where can you obtain a mutual fund prospectus and SAI? You can typically download the most recent documents from your fund’s website. What can the fund do with your money? When you download a prospectus you will notice that one document often covers many different funds offered by the family. That’s another little technique I think they use to intimidate and confuse readers. Don’t worry. We’re not turning back. You can see that the table of contents is pretty friendly. 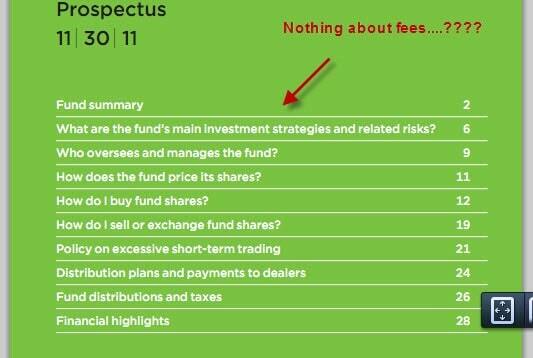 The only problem I have is that the table of contents doesn’t tell you where they talk about fees. Again, I wonder why that is? No worries…we don’t have to go far to find this information. It’s on the very first page. I’ll give them points for that. In this case there are a variety of share classes. Depending on who sells you your funds and what kind of investment advisor you work with, you may pay as much as 5.75% front-end commission or as little as nothing. Crazy…I know. Let’s assume you buy Class Y and pay no sales load. That’s good, but you’re not done. There are also annual fund operating expenses. Every fund in the universe has operating expenses. Nobody works for free. You can see that the Class Y shares we bought have a total operating expense of .92% per year. It charges .55% in management expense and .37% in other expenses. Those “other expenses” are for general administrative, legal and marketing charges. To give that .92% meaning: if you invest $100,000 in this fund, you’ll pay $920 each year. Not egregious if you ask me. How does the fund collect this money? They take 1/52 of .92% of whatever the value of your account is every week. They don’t take that $920 out of your account all at once. So assuming your account value stayed constant all year, they would take 1/52 of that $920 every week. Yes, but they are harder to find. Every fund has turnover. “Turnover” is the number of times stocks in the portfolio are bought and sold throughout the year. When stocks are bought and sold, the fund incurs an expense and the investor pays the bill. The cost associated with turnover is made up of two elements. First, there are commissions to pay. And as more trading occurs, the chances are higher that gains will be locked in. That means that as turnover increases, there is the stronger possibility that short-term capital gains will have to be reported and paid for. On top of those commissions and taxes, there is the slippage cost. “Slippage” is very expensive. Let me explain. When you buy 100 shares of XYZ stock, that order isn’t going to move the market because it’s such a small order. But when a fund company buys 100,000 shares of XYZ stock, they are going to push the price up. When they sell their shares, they cause the price of the shares to drop. That’s because they dump a huge amount of shares on the market. And that’s called slippage. John Boggle of Vanguard fame did a little study and found that, on average, 100% turnover adds another 1% in costs to investors. If that’s true, the 176% turnover of this fund means investors lose another 1.76% every year. That’s a lot of cabbage, and as you can see it’s almost twice as much as the total management expense of this fund. Let’s go on. The performance presentation is pretty easy to understand in this prospectus. 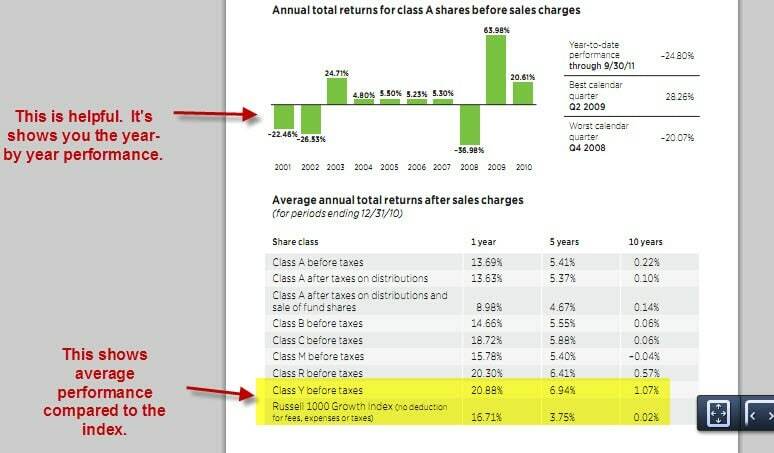 We can see (on the top half of the diagram below) how the fund performed each year. This gives you a good measure of potential volatility too. The bottom half of the figure shows how our shares did compared to the index. This seems straightforward to me. Does the prospectus disclose risks? It turns out this fund uses “derivatives, shorting and leverage.” Rather than take the time to explain these terms, suffice it to say that if you read this section (and you should), you might decide right there and then that this fund is not for you. You can see as you dig in that the fund is actually far different from what we thought it was at first. But assuming you haven’t been scared off yet, let’s keep going. Just make sure you read the section about risk in your fund’s prospectus and be sure you are comfortable with what is going on. 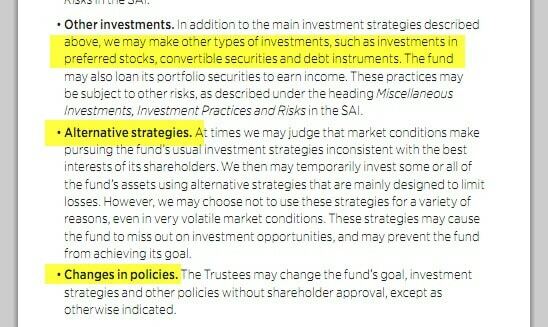 We can clearly see the fund is permitted to make “other investments,” use “alternative strategies” and make “changes in policies.” Remember, we thought we were buying a growth fund, which is stated in the “Investments” section. Now we come to find that the fund manager can pretty much do what he/she likes. Let’s look at the investment manager information. This also starts off to be rather benign until it talks about “performance adjustments.” I don’t like this at all and here’s why. A “performance adjustment” means the manager is paid more if he/she performs better. That means they have an incentive to take on higher risk. If they take on risk and it doesn’t work out, it’s no skin off their nose – you are the only loser. They still get paid. But if they swing for the fences and knock it out of the park, they make out like bandits. In this case, the maximum performance adjustment could reach 20% of the base pay. That’s a lot of incentive to take on risk – not risk for the manager of course, just risk for you. Why is my advisor suggesting this fund? To make matters less attractive (and this is the part about Wall Street that I really think stinks) this fund pays brokers an incentive if they get “critical mass.” In other words, if the broker/dealer sells lots of this fund, the firm will receive higher payouts. This totally destroys the concept of putting the investor before the advisor, and I can’t stand it. It’s why I became an independent financial advisor in 1993. But I digress. 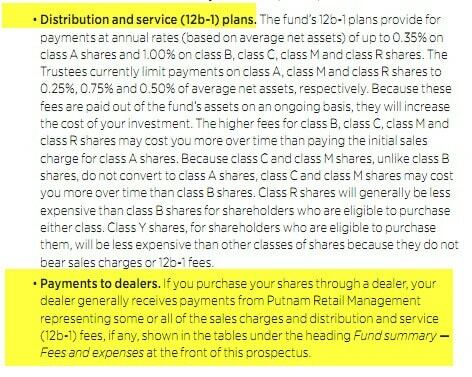 The prospectus goes on to discuss even more ways the fund pays off the broker dealer, but I’m so disgusted by this I just don’t want to talk about it anymore. You get the picture. Towards the bottom of the prospectus you can see “Financial Highlights.” This is important information as well. It spells out the net asset value of the fund at different time periods, the income, gains and dividend distributions. Good information to have and difficult to obscure. Now let’s turn to the Statement of Additional Information. There is some very interesting information for us there. It’s always smart to review the table of contents below to help our navigation. If you look under “Investment Restrictions” you might find a few disturbing things. First, this fund can borrow up to 33 1/3% of the value of the total value of the fund. When they borrow, they use “leverage” to buy shares with money they don’t really have. That adds a great deal of risk to the investment. They can also make loans, buy/sell commodities and get into the real estate business. Holy moly! What’s next, are they going to open a pawn shop? The “Restrictions” area is really important to read. In this case, it goes on in great detail to explain how they can change almost any and all of the rules spelled out in the prospectus. 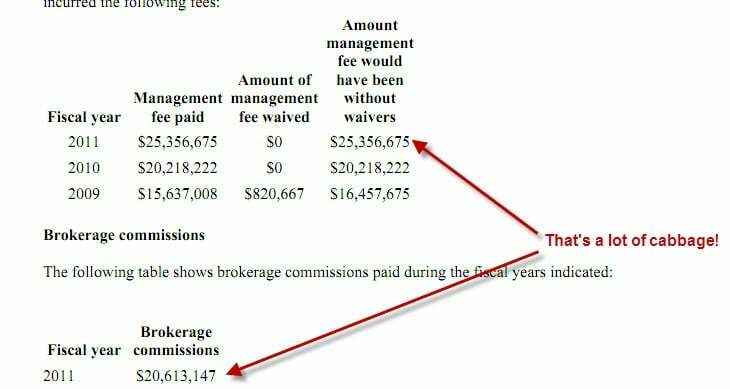 The “Charges and Expenses” section breaks out how much they can pay off the broker/dealers in exchange for even more business. Yuk. It also shows how much the fund paid out in management fees and commissions. As you can see, it’s an astronomical number. 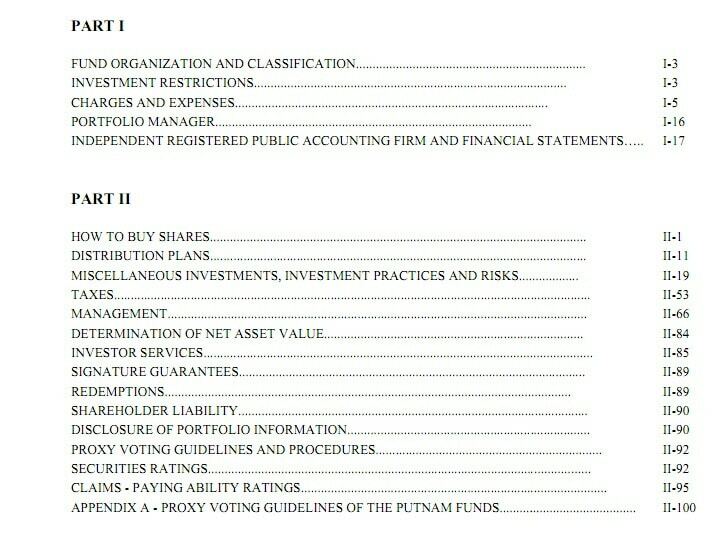 Later on, the document discloses how much various broker dealers invest in the fund. This is not how much money the clients of the broker firms invest – it’s how much the brokerage firms themselves have invested. I don’t know about you, but to me, that smells like someone with a vested interest rather than someone acting as a fiduciary. The SAI goes on and on, but I think you get the picture. It’s a very important document to review if you want to really understand what’s going inside your fund. The prospectus and the SAI are not difficult to understand. They tell you what the fund can and can’t do with your money and how much they are going to charge you for doing so. 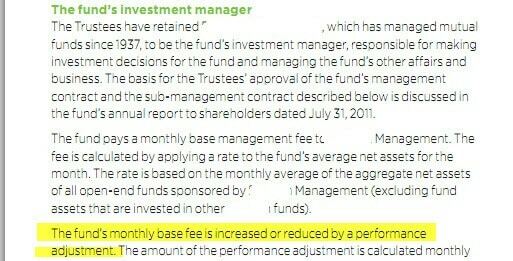 They tell you if your advisor is getting extra payments in exchange for pushing the fund and how the fund has performed. If you read this entire post, it probably took you more than five minutes. But you can use this as a guideline. Now you know what to look for and what to watch out for. I guarantee that if you do, it will take you less than five minutes to make a decision about the fund you are considering buying. Should you go through this exercise every time you make an investment decision? If you are a buy-and-hold investor, you really should. After all, you are going to be married to this fund for many years to come. It only makes sense to really understand what the fund is all about. I personally don’t believe in a buy-and-hold strategy. I like investing in funds that are doing well right now and refraining from investing when the market demonstrates weakness. This is a unique form of market timing and I like it. I let the performance numbers tell me what and when to buy rather than the prospectus. What do you look at when you purchase a mutual fund? Have you ever read a prospectus? What was it like? It’s amazing how many people don’t know the MER’s that they are paying.